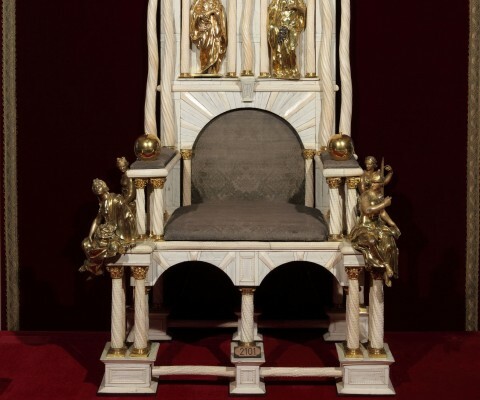 The coronation chair of the Danish kings, used at coronations between 1671-1840 during the institution of Absolute Monarchy, by Bendix Grodtschilling 1662-1671. 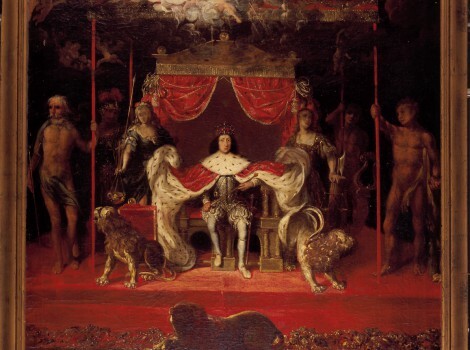 The gilt figures were added during Christian V’s reign. 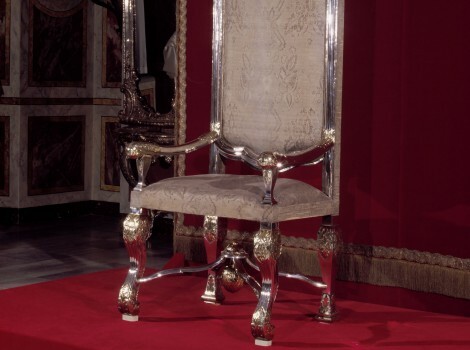 The chair was used at coronations from 1671-1840. 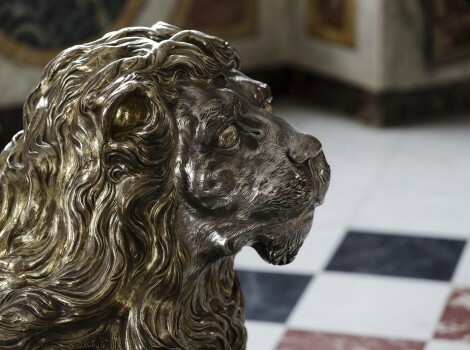 Frederik III ordered this chair along the same lines as the silver lions, inspired by the stories of King Solomon from the Old Testament. To further enhance its legendary status, it was said that it was composed by unicorn horn. In reality, however, it is made from narwhale tusks, a material the danish kings could initially claim almost as their own because of the danish ownership of Iceland and the Faroe islands. Christian VIII was the last coronated king, 1840, and immediately after the succesion of his son King Frederik VII in 1848, Frederik VII signed the first constitution in 1849. 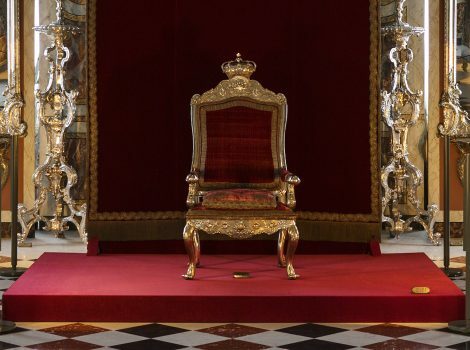 Since regents are no longer coronated, the subsequent succesions up until this day, have traditionally been marked by the proclamation of the death of the old regent by the primeminister, followed by three “long live…the new regent”, from the balcony of Christiansborg. 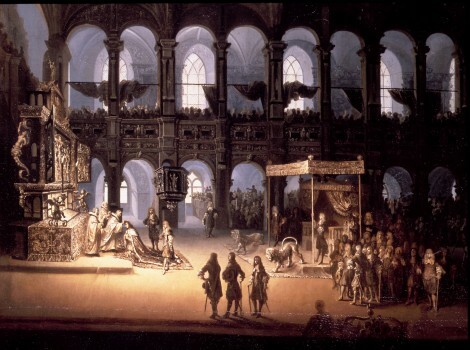 Christian V’s coronation in the chapel of Frederiksborg Palace in 1671. Sketch for an engraving, painted by Michael von Haven. The Ampulla of gold with enamel and table-cut stones. 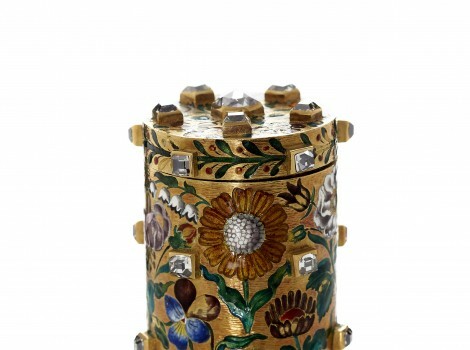 Made for the coronation of Frederik III in 1648 by an unknown goldsmith in Copenhagen. Used at anointings during the period of Absolutism. 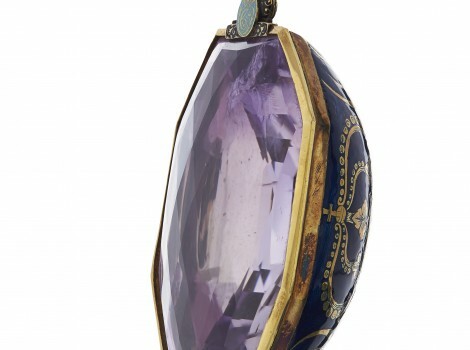 Amethyst (1305 carats/261 g.) in a casing with Christian V’s name in gold on enamel, possibly made by Paul Kurtz, 1671. The jewel was only used when the kings sat on the throne during the anointing. Armchair with silver covering. Made by A.F. 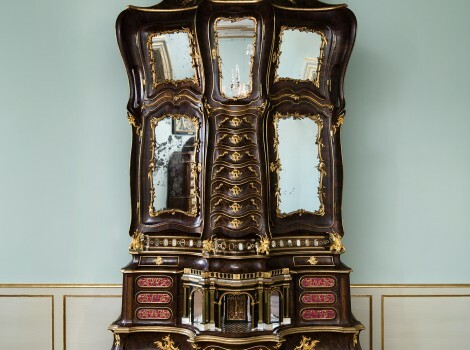 Holling in Copenhagen, 1740, for Christian VI's Audience Chamber at Christiansborg Palace. Three silver lions, made l665-1670 in Copenhagen by Ferdinand Küblich. They are used on solemn occasions as guards around the throne and the Royal catafalque.